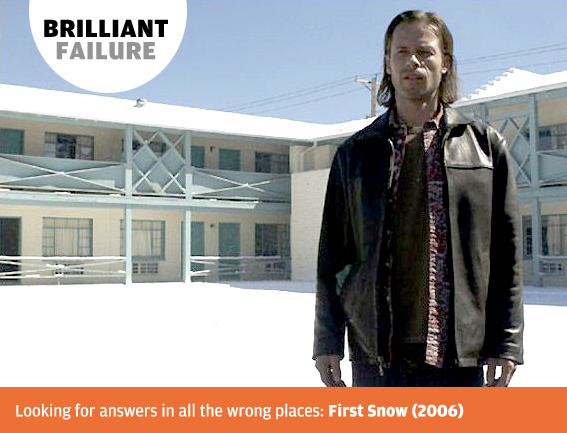 Mark Fergus’ debut feature First Snow initially appears to have much in common with Christopher Nolan’s breakthrough success Memento (2000): both are neo-noirs with Guy Pearce in the lead role, while the central protagonist in each film becomes increasingly unstable due to never having quite enough knowledge to make sense of his predicament. First Snow, however, is more concerned with metaphysics than impaired memory, although Fergus still relies on a crime-related sub-plot. Two crucial elements elevate First Snow from being dismissed as the lesser-known cousin of one of the most-discussed independent films of the previous decade: the central character here is haunted not by his past but by his future – a state of psychological flux stemming from a mystical prediction solicited on a whim rather than a blow to the head during a burglary – while Pearce delivers an excellent performance that clearly distinguishes First Snow‘s slick sales rep from Memento‘s unreliable vigilante. Jimmy Starks (Pearce) is a New Mexico flooring salesman with a potentially lucrative side-line in classic jukeboxes whose life takes a strange turn due to a spot of car trouble. 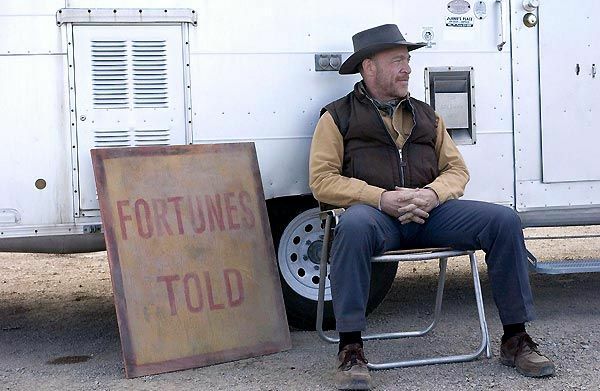 Stranded in the desert when making a sales call, Jimmy visits a fortune teller (J.K. Simmons) to pass the time. The fortune teller makes some predictions, then experiences a violent reaction while reading Jimmy’s lifeline and asks his customer to leave. Jimmy returns home to his job and girlfriend, but is prompted to return to the fortune teller when a few his predictions – a financial windfall and an investment offer – turn out to be correct. After some coaxing, the psychic informs Jimmy that he will die when the first snow of the year starts to fall. Jimmy is shaken by the news, and becomes increasingly stressed after learning that his childhood friend Vincent (Shea Whigham) has recently been released from prison. Jimmy and Vincent were involved in an ill-conceived illegal enterprise that led to Vincent’s incarceration, and Jimmy fears that Vincent will return bearing a murderous grudge. 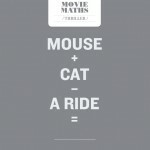 As in the more widely-seen Memento, the drama in First Snow revolves entirely around Pearce’s performance, which covers a range of attitudes and emotions – cocky, controlled, desperate, depressed, resolved – whilst remaining consistent and credible despite some unfortunate lapses in narrative logic. 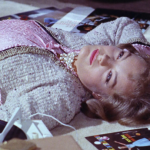 The focus on the gradual unravelling of Pearce’s hustler means that there is little room to develop supporting characters, such as his realtor girlfriend, Deirdre (Piper Perabo), or his colleague and confident, Ed (William Fichtner). Yet this is perhaps appropriate for a story about a man who keeps even those closest to him at arm’s length, and regards everyone he encounters as a potential source of income. First Snow flirts with mysticism and the notion that sudden self-improvement can be prompted when misfortune is predicted, with Pearce effectively conveying Jimmy’s acknowledgment of past mistakes and need to make amends in case he is about to meet his maker. Unfortunately, the narrative machinations that Fergus employs to take Jimmy on his spiritual journey are not as sure-footed as the characterisation of his leading man. First Snow lurches uncomfortably into crime thriller territory with the introduction of Vincent, whose lengthy prison stretch may have been the result of Jimmy’s cooperation with the authorities out of fear of jail time. Vincent is a largely unseen menace, taunting Jimmy on the phone with thinly-veiled threats but remains physically elusive; while such an antagonist would usually be effective in a suspense piece, the presence of Vincent adds a disappointingly conventional element to the story. The many ways in which Jimmy could more unexpectedly meet his demise at any juncture are more quietly unsettling than an ex-con with unresolved betrayal issues, but Fergus has Jimmy risking the loss of potentially lucrative flooring accounts in order to keep tabs on Vincent, who is obviously something of a red herring. After exhausting this narrative avenue, Fergus and co-writer Hawk Ostby play for time in the desert as Jimmy checks into a cheap motel room for a booze-soaked extended stay. 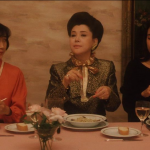 Despite these narrative missteps, First Snow remains an involving and genuinely unusual neo-noir, while Fergus also utilises Eric Andrews’ striking cinematography and Cliff Martinez’s subtle score to atmospheric effect. As with Memento, the conclusion of First Snow finds the central character driving alone down an open road, and Fergus achieves a coda that is equally existential.